Here's another fate wall from me made bit by bit over the past few weeks, haven't got that much time anymore due to new job. Sized up the scan and cleaned it, the rest is brushes and a few different merged backgrounds. I left a space on the left for icons, might go well with a red desktop theme or something. Anyway, I love dar Saber! Too bad she wasn't shown in the anime. 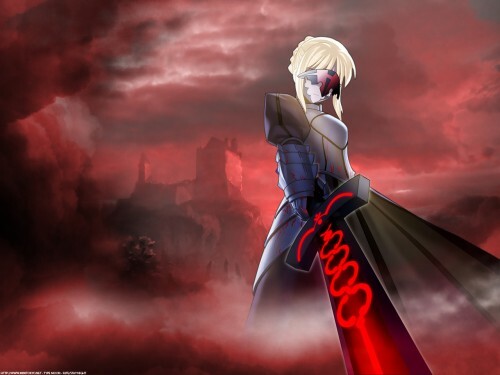 I like the background which sorta represents a fallen castle probably to represent that she has been corrupted *cough* sice she's King arthur *cough*. I also like the reddish dark color! whoopie! dark saber, too bad it didnt come out in a show. Now that should've been the right combo.